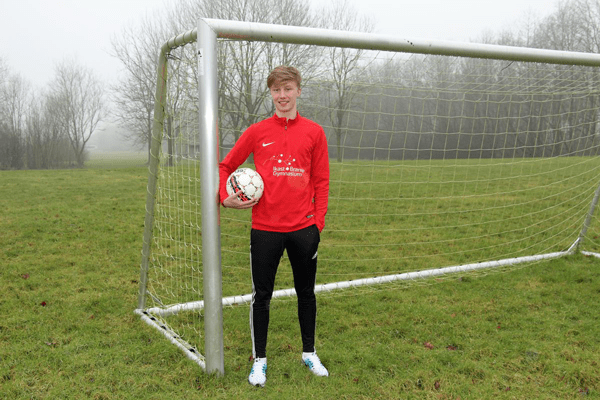 Thomas Brown, a student-athlete from England on the talent squad at FC Midtjylland at Ikast Brande Gymnasium, Denmark. Should young athletes have to choose between continuing education and playing sport at a high level? This is certainly not the case for Thomas Brown, a student-athlete from England who is on the talent squad at FC Midtjylland and a boarding student at Ikast Brande Gymnasium, Denmark. He is currently completing the IB Diploma Programme (DP) to assist balancing his sporting and academic goals, and enjoying an ‘intensive collaboration’ between the club and the school. This includes additional classroom and teacher support, extended deadlines if necessary and adjusted timetabling to allow for morning training sessions. Many schools and students face similar challenges, and, as a result, many aspiring young sports stars find it difficult to find a school that adequately supports their sporting commitments and academic aspirations. This is something we at the WAoS are addressing, through their work with the IB. To help young athletes achieve a better balance between sporting and academic commitments, WAoS works with international sport and education partners to create bespoke educational programmes. Some of our partners include: World Rugby, International Ski Federation, International Hockey Federation, World Badminton Federation, FIBA (International Basketball), International Cricket Council, International Netball Federation, United World Wrestling, the International Paralympic Committee and the International Olympic Committee. Our directors have successful backgrounds in establishing high-performance sport structures prior to setting up WAoS. They saw that World Champions and Olympians often struggled to make the transition into their new lives upon retirement from competition and believed that something needed to be done institutionally and internationally to better support them. It is well-documented that if students forgo education for sporting aspirations they limit their choices when retiring from competitive sport. So at the end of their sporting career, they wonder what is next. An education is vital for student-athletes to prepare for a dual-career approach. This, in turn, allows athletes to maintain a balanced approach throughout their sporting careers and ultimately better transition when competition retirement occurs. WAoS works with schools to achieve Athlete Friendly Education Centres (AFEC) accreditation. This process allows schools to work with an assessment team to address ways student-athletes can best combine sport and education and the role that schools can proactively take to support them. To become accredited, schools must meet defined criteria and demonstrate that the school understands the requirements of high-performing student-athletes and strive to assist them via promoting athlete-friendly flexible policies and procedures throughout the school community. In our IB sports pilot project, it means that IB World Schools that become AFEC-accredited offer student-athletes the opportunity to complete the DP over an extended period, usually three years. For example, DP student Mark Swanston, from Island School in Hong Kong, says the extended study option allowed him to pursue his dream of playing football professionally, while fully concentrating on his education commitments. “The wonderful teachers at my school fully supported my decision, dedicating their time to ensuring I got a good balance between sport and academic activities. As a consequence, I made my professional debut in the Hong Kong Premier League at the age of 17, and will be hoping for many more appearances to come next season,” he adds. All AFEC-accredited IB World Schools form the IB Sports Pilot Project. WAoS and the IB are working with teachers, student-athletes, coaches and parents to gather information on the best strategies for providing flexible approaches to learning and how schools can best support student-athletes. This research is vital to further develop solutions that will understand the needs of student-athletes and better support them in balancing their sport and education commitments. As part of the project we are fortunate to work with a committed group of athletes who have performed at the top of their personal sports and who have experienced what it’s like first-hand to balance their academic and sports studies. Olympians have been trained to assist schools through the assessment process and the on-site visits. During the visits, they spend time with student-athletes to share their experiences and expertise in this area. Each athlete and sport is unique whether it be a team or an individual sport. Training hours differ between sports, and domestic and international travel requirements need to be considered. For some sports, such as skiing or surfing, weather is also a factor as to when training and competitions can take place. There is no ‘one-size-fits-all’ when schools are working with student athletes. However, creating more systemised approaches and flexible options for student-athletes in school communities, as well as developing a network of like-minded schools is essential for aspiring athletes to thrive inside and outside of the classroom.